Riley turns 3 months tomorrow so I thought now would be a good time to fill you guys in on what being a mom to two kiddos, two and under, has been like for me. To say it’s been hard is a gross understatement. I never in a million years could’ve realized just how hard it is and because of that, I have grown so much respect for all the other mothers out there. Goodness, especially to mothers who have twins or more! What we do on a daily basis is pretty much superhuman. The first month of Riley’s life was an adjustment but honestly not terrible. As many of you know, infants usually sleep the majority of the time for the first few weeks of their lives. And Riley was a really great sleeper at the beginning! I remember our first night with him in the hospital we had to wake him up after five hours because he needed to eat. I think the nurses were even a little upset with me for letting him go five hours. But I went with my gut and he seemed fine so I let them sleep. Plus I think that I just was so used to Molly being a terrible sleeper for the first nine months of her life that I wanted to encourage sleep with our new baby as much as possible. So the first month Riley was pretty much a breeze and really Molly was the challenge. She definitely displayed some jealousy in the beginning. I remember in the first couple months she would always say “baby nap!” when she wanted me to put the baby down and pay attention to her. And at times she acted out. I remember telling friends in the first month that an infant was a walk in the park compared to my almost two-year-old. But in a month, that all changed. During the second month was when Riley really started to wake up from his newborn haze. He wanted to be held constantly and pretty much wouldn’t sleep anywhere unless it was in my arms or with me carrying him in a baby carrier. I spent most of the month pacing around our house with him strapped to me, trying to get him to go to sleep. I remember checking my fitbit at the end of the day and seeing that I had walked 20,000 steps on some days! And on many of those days I wouldn’t even leave the house. That would literally just be me pacing around the house trying to get my child to sleep. He was also waking up consistently every 2 to 3 hours throughout the night so I definitely wasn’t getting sleep. And with Molly waking up between 5:30 and 6 AM every morning, it really didn’t make things easy. I think that’s one of the hardest parts for me about being a mother to two young children. When Molly was little and would wake up every 2 to 3 hours to nurse all night, I could at least extend the night and sleep until eight or so. Whereas when you have two, Riley will wake up to nurse all night but then I have to wake up at 6 AM with Molly regardless – even if Riley goes back to bed after his 6 AM feeding. In month two, Molly showed a lot less jealousy and a lot more love for her brother. So in terms of who was the biggest challenge during this month, I would say Riley. Molly was more fascinated with her baby brother and just wanted to snuggle with him every chance she got. We are just finishing up the third month and I think it’s safe to say that both kids have been equally challenging this month, but also a tiny bit easier than the second month. Riley has actually been sleeping better. He’ll do 5 to 6 hours his first stretch during the night pretty consistently. However, the last three nights he was up every 2 to 3 hours so I’m really hoping he’s not going through a sleep regression right now. I’ve heard the first sleep regression doesn’t happen until 4 months, so I’m hoping I have a little bit more time with him being a good sleeper. And honestly, I’m just hoping he skips a sleep regression altogether! Wishful thinking right?! But for the most part in the third month, Riley has slept very well. I’m still super tired because being a parent is exhausting and I am still waking up one or two times a night to nurse him, while getting up at 5:30/6AM to start my day with Molly – even on his best nights. But it’s a different kind of exhausted than getting only four hours of sleep every night because he is waking up every 2 hours. We’ve also gotten Riley on a schedule of sorts. In 3 hour intervals he nurses, stays awake / plays and then naps (EAT, WAKE, SLEEP). During the first two months he was too little to really be on a schedule but we are doing our best to keep him on one now. Molly on the other hand is going through a bit of a regression herself. She went from being extremely independent to needing her mommy 24/7. I’ve mentioned this to you guys before, but we recently got a nanny and it’s been great. We hired her through an agency called The Nanny League. I highly recommend them if anybody out there is looking for a nanny right now themselves! I’m not sure what areas they serve, but they’re worth checking out. Anyway, I think a big reason this third month has been a bit easier is because we recognize that we needed help and we got it. She’s only with us part-time. Every morning from 6:30 AM until 11:30 AM when Kevin gets home from work. But it completely changes my mornings. I still have Riley the whole time she’s here, but it’s so helpful to have her to watch over Molly and to take Molly to the park so she can get the attention she deserves. However, Molly has really had a hard time leaving my side the past week. So when our nanny comes in the morning, Molly won’t let me leave the room. Normally what I’ll do is take Riley into my office so I can work while our wonderful nanny plays with Molly in the other room. So needless to say I haven’t gotten much done this week. And our nanny has only been with us for a few weeks so I’m hoping Molly will grow out of this soon. I’m not using her name on here for her privacy. She’s a very private person so that’s why I’ll just refer to her as our wonderful nanny. So anyway, that’s what’s going on in my life. The first three months have definitely been challenging and so much harder than I could’ve imagined, but it’s also been more wonderful than I could’ve imagined too. And that’s the truth. I keep wanting to tell myself, now that the first three months are behind us it’s going to get easier. But I remember with Molly that months 4 through 9 were actually some of the hardest. Especially as we got closer to 8 and 9 months because she hadn’t slept more than 3 hours for 9 months straight. But I’m hoping that’s not gonna be the case with Riley. I’m hoping things just get better and a little more manageable as I learn to navigate this whole being a mom to two kids thing. For now I’m just taking it day by day. And really the shirt I’m wearing in these photos couldn’t be more perfect. I’m trying to breathe through the hard parts, love these two little humans with everything I have, stay true to who I am by not giving up all the things that make me me and in the end hopefully be a shining light that my kiddos can look up to. P.S. How HILARIOUS is Molly’s face in the above pic! Ha! I’d love to hear all your experiences in the first three months of parenthood with multiple children. Any advice for me? Things that work for you? Or really did anyone just want to share their story of any hardships you’ve dealt with. I wanna hear it all! Comment below! I’m sorry to hear that. Sounds like your little guy is giving you sooo much love!!! Hi! I love reading your blog Ali. I have 2 girls, Ava who just turned 3 Aug 17th. I also have Eliza who was born on May 28th. My question for you- have you started working out again? It’s so hard to have time to work out with 2 littles. I want to lose 10 pounds, that’s my goal, to the weight I was when I got pregnant with my 2nd. Also I remember loving watching you and Roberto’s season! I watch bachelor and bachelorette…but too busy so I haven’t been watching bachelor in paradise. Thank you for this Becca! Your story truly makes me so happy! I know it will get easier and be soooo worth it! And yes!!! PLEEEEASE let me have that gift! 12 hours would be AMAZING!!!!! Thanks for reading love and fingers crossed for both of us in the sleep department! I love reading your posts! Your little ones are adorable and you seem like you are an amazing mom! I am a mom of 3 month old twins, so close in age to your little one. I do not know how you do it with a toddler! I love all the advice and tips from your posts and you have such a positive outlook on everything! It is very difficult being a mommy of two but I cherish every single day with them and I can obviously see yku do as well 🙂 Looking forward to reading more!! Hi Ali! Thanks for always being so candid about motherhood and it’s wonderful ups and downs and contradictions. 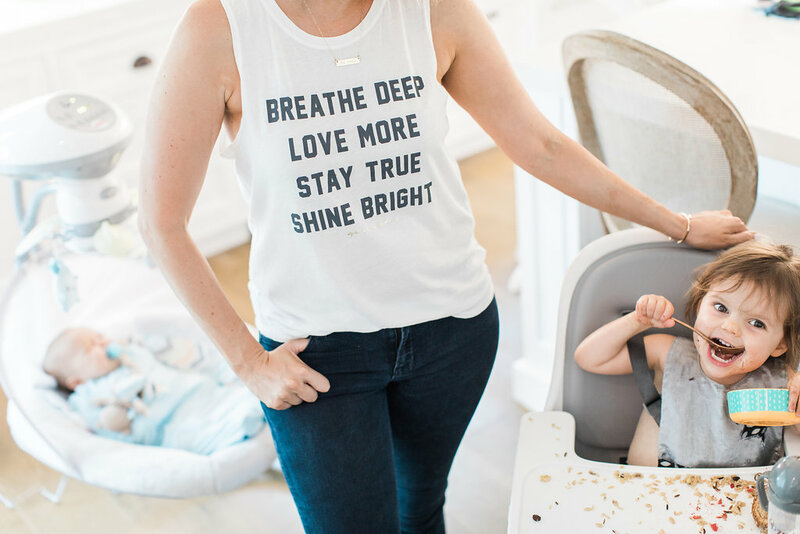 There’s a lot of voices coming at us moms and I appreciate your honesty! My twins are 19 months (boy/girl). The first 4.5 months were hard enough that sometimes I still get sick to my stomach thinking about them :(. Both my babies had colic and it looked different for each baby but it all added up to a lot of stress and sleeplessness. One thing I always appreciate about you is the priority you put on your kids sleep. It is really SO important for their growth and development! I’m pretty strict about my kids sleep and find that our entire house runs better when we all sleep well! The only thing I wanted to recommend was a book that was a life saver for me. “Healthy Sleep Habits, Happy Child (I read Happy Twins)”. He’s the foremost researcher on infant sleep but writes as a father and a doctor so it was a game changer for a weary and hopeless Mama! Praying for you and love following your journey! I cannot find the winner of the giveaway can you please let me know who it was? I can’t find it either!! So sorry that was confusing guys. So my bad. I just added it to the top of the blog. I had responded to the winner’s comment in the post. But I should have made that clear. Sarah Geshell won. I will do another giveaway next month!!! Oh Ali! Congratulations first of all! I had two under two at one point as well. They are now 5 and 4. Everyone told us the beginning would be so incredibly challenging , boy were they right! It’s exhausting have two so close together. I’m here to tell you it 100% does get easier. Of course only with time. Mine play so so well together and love each other so much. It’s so heartwarming to watch. I can only hope they continue to love each other like this until their in their nineties. Right?! That’s what all of us Moms want! Good luck and lots of love from Vancouver , Canada. Ali – thanks (as always) for keeping it so real and raw on your blog. I have a 3.5 and 1.5 year old who are 22 months apart! The beginning was definitely the hardest part but hang on because it seriously gets sooooooo FUN!! They are each other’s best playmates, they laugh, they kiss and hug, they gang up on me, it’s so wonderful. 🙂 You’re doing a FANTASTIC job. Day by day is a great perspective and remember the good and challenging is all a phase. Thanks for continuing to share your story with us so openly! When Riley gets to be 1.5 is when I actually when I think it REALLY will get easier. Is that what you found? When did things really start feeling more manageable for you? Your kids are so cute! I have my 2nd son Molly’s age. What I found worked with him as a baby was to not run in to his room right away. If he woke up from a short nap or in the night I would actually time myself and give him 10 mins or so before I ran in there. A lot of times that allowed him to self sooth and become a better sleeper. I learned that it made it worse for me and him if I went in and tried to save him. Especially at that 4 month sleep regression. This is where I messed up with my first and had to sleep train bc he was so dependent on me to get to sleep. Hope this little bit of advice helps. It made a huge difference in our sleep and my baby’s sleep! Motherhood is not easy but luckily the other side of it is how much you love your babies so it’s 100% worth it all. Ali I am only 18 and don’t have any children of my mine. However I am a nanny of 3 kids and wow it is hard! I am typically with them from 9-5ish and I am warn out and ready to go home and chill by the end of each day! You on the other hand can’t just leave. So you are a superhero in my eyes! I love all your blogs! It has been so much fun seeing all the incredible things you have done with your home! I’m a nanny as well!! I always say that i get the best of both words, i get to love and play with them all day but i get to go home and rest/sleep! We will be welcoming our third in early October, and I’ll have a 4 year old, 2 year old and a newborn! I honestly forgot about the EASY method and most other things newborn related, so I will need to get back into that groove! My kiddos are early risers too/ how nice it must be to have kids that sleep till near 8am or later. Thank you for sharing this. I’m getting ready to be a mom with 2 under 2-my second will be here in November and my other baby will be 14 months. It’s nice to read about a real experience from someone who is going through it now. I’m crossing my fingers that Riley stays a good sleeper for you!! Keep up the amazing work! Hang in there Ali! You are doing a great job! I have two boys 21 months apart and remember those days. It gets so much better. You will sleep again I promise. Now my boys are 7 and 9 and it is my favorite stage so far – so much fun! I am in a similar situation with pumping and caring for a 2 year old and 8 week old. I constantly and repeating the words of that song to myself! Glad to see someone else is too! My kids are 18 months apart and my baby turns 1yo tomorrow! I love your honesty because it’s true – it’s so so hard. I look back at the first several months and it’s a blur. Things got much better when sleep started to happen, so I’m hoping that falls into place for you. Now that my kids are 2.5yo and 1yo it is actually easier than having one in some ways. They play together so I find myself able to sit with a hot cup of coffee in the morning. Amazing! Since they are close in age we go to activities they can both participate in. They nap at the same time in the afternoon and I am able to have a few hours to myself to work (or on harder days, nap). Watching them become best friends is really magical and my heart is so full! Hold tight, it gets so much easier and it happens very soon! I’m only a few months ahead of you but it feels so much better now. And people keep telling me it gets even better from here. Thank you for your honest words because they make me feel less alone on this crazy journey! Love to all the mommas out there. Superhuman is no understatement. Put your little lady in a moms morning out program or even a 2 day a week preschool! It’ll be wonderful for her independence and social skills! My 2nd child shares Riley’s birthday, and just in the past week it’s getting better. 7hr stretches of sleep has been a huge help. My 2Yr old has always been a good sleeper, so I’m not as exhausted as I was in mth 1 & 2. At first my Toddler only wanted my attention, so when my mom was over to help, I’d hand off baby to take care of him. He’d scream if anyone else did anything for him. He’s getting better, but sometimes I just wish I knew what he was trying to say!! Molly is miles past my little guy with talking and the alphabet, so it’s frustrating for everyone when we don’t know what he wants. We speak English and French to him, so eventually he’ll catch up, but I can’t stand to see him upset. I try to read to both kids at the same time and encourage my toddler to gently play with baby, or show him his toys. I really should enjoy this baby stage because they grow up so quick! I just can’t help wanting them to grow up and play together! Molly’s too cute reading to Riley! You are doing amazing! my kids are 2 years apart and are now 4 and just 2 and its only finally getting easier! the 4 year old can be left alone while i get things done while the 2 year old naps or plays. the first two years were so hard! keep your head up. I have 2 as well about the same ages as yours and boy is it exhausting! But oh so wonderful! My littlest is now 9 mo and is still a terrible sleeper 🙁 I’m hoping that changes soon! Thanks for helping us moms feel like we’re not alone! Hi Ali, love your blog! My son (also named Riley!) is almost 4 months now. I was reading through your post and couldn’t believe the similarities. I, unfortunately, am still waking with him every 3 hours at night 🤦🏼‍♀️ I was having to hold him for every single nap, so I definitely know your pain! Do you still hold Riley during his naps? If not, how did you break that habit? I’m able to put my little one down for each nap, but he only sleeps for 30 minutes, then I have to hold him for another hour while he sleeps. Exhausted is an understatement, so I am happy to read that things get better! Wondering the same than Summer. My little one is 2 months and just wants to be held for naps. Do you have any tips to break the habit? What did work for Riley? I had a little trick for breaking my 1-2 month-old wanting to be held during naps. I used the Boppy Lounger, placing it right by me on the couch or bed so when Baby Girl finally fell asleep I would move her slowly to nap on the Lounger. She typically stayed asleep this way. I plan on using this for my son as well; crossing my fingers it works with him! I couldn’t imagine 2 under 2. My baby girl is 5 and a half months and we skipped over the 4 month regression but she is going through the 5 month leap and let me tell you, it is ROUGH. Awake crying every 20-30 minutes. You are doing an amazing job and you make it look easy. Please share upcoming month experiences. Do you plan on sleep training or just going with your regular schedule? Hey Ali! I always love reading your posts. My daughter is 2 now, and the “Ok to Wake” clock has been a LIFESAVER for us! Olive has consistently been an early riser since infancy, but now that she’s staying up later during the summer, she was still waking up wayyyy too early in the morning, and thus not getting enough sleep. I’d highly recommend that clock! You can get it on Amazon. We set it for 7am, and Olive knows we won’t come in and get her until the green light comes on (which is the way it lets them know they can get out of bed). For what it’s worth, might help your mornings! My sister in law uses the “OK to Wake” clock and she says it’s a lifesaver! Her oldest daughter would get up around 5am and now with the clock she doesn’t come out until 7am when the light changes colors!! What time does Molly go to bed?? Just wondering because my child has VERY early wake up time and I can’t seem to break it! Ali! I love following you on Instagram and your blog. I am basically a mom in your shoes. I have a daughter that turned 2 years old a month after my son was born. We are just a few months ahead of you at 2-1/2 years and a 6 month old. It has been WAY harder than I thought it would be and it is so nice to relate to your posts so I don’t feel alone in my struggles. I work full time and it’s so challenging to function when up most of the night nursing and our 2 year old has started having bad dreams, crying through the night. Our daughter is STILL struggling with accepting her brother and sharing attention but I am hopeful she will eventually warm up to him. Oh my gosh!! Our son was born the day before Riley, May 23rd. He was also sleeping in a 6 hour stretch at night but the last week he reverted back to doing 2-3 hours consistently! I was wondering the same thing about sleep regression, thinking it was too early. Read a little into it and maybe it’s a growth spurt? We are trying the Merlin Suit to see if it helps at all, since he hates his arms being swaddles now, but is too fidgety with his arms free in a sleep sack! Good luck, mama!! You aren’t alone! I have an 8 month old and. Just turned 2 year old (16 months apart) so I TOTALLY get where you are! My two year old acted exactly as Molly did, but now that the baby interacts more they actually play- which is so cute! My baby also sleeps through the night now, which is a game changer. I remember when it was up every two hours to feed then up at 6am with the toddler for the day- the worst! I promise it gets better soon!! Ali, I love your blog! I have never commented but I love how real you are about everything! Becoming a mom to more than one child is sooo overwhelming whenthey are so young! I had my twins when my son was 2 and it was survival!!!! No sleep and a nightmare! Kudos to you for hiring a nanny! We would have but my husband is in school fulltime. My twins are 1 now and still wake up 2-3 times per night! I hate teething! Hahaha! I would encourage you to just go with the flow and let all preconceived ideas of motherhood go. 🙂 I have always been ocd and perfectionist but now I am quite happy if they ateall fed and diapers changed! You’ve got this momma!!! Oh my gosh! Our son was born May 23, the day before Riley and let me tell you, we are expediting the same issue with sleep at night! He had been doing one six hour stretch consistently for a month now, but the last week he’s been waking up every 2-3 hours! I was thinking the same thing about an early 4 month sleep regression, but I did some looking and maybe it’s a growth spurt? Missing the sleep for sure, but you aren’t alone! We’re trying the Merlin Magic Suit to see if it helps, since he hates his arms being swaddled now but is too fidgety to be in a sleep sack with his arms free! Good luck, mama, you’re doing a great job!! I’m definitely in a similar boat. My first son is will be 23 months 8/26 and my second son will be two months 8/26! Two under 2 is no joke! For the first 6-8 weeks I couldn’t lift my oldest due to having a c-section. It was really hard for both of us. But now that I can lift him again things have been better but he got some great bonding time with dad. He hasn’t really been too jealous of his little brother, just seems to not want to share grandma with him! He tries to help out and wants to hold him and hug him a lot, so very similar to Molly being very interested 😊. Love you blog post on this as I feel I’m in a very similar place and just trying to take it day by day! It’s tough when you are trying to make dinner or something and they are both crying and need Mom! We have a 2.5 year old boy and a 3 month old girl. I feel every struggle you mentioned here! At first I felt like I would never leave the house but now it’s so easy. I gave birth to my son in December, my daughter was 23 months old when he was born. I will never forget the first 2 weeks after I gave birth to him, my mental health declined immensely and I cried all the time. It didn’t help that my daughter had bronchitis when he was born so my son and I were basically quarantined away from her for days until she felt better. The one on one time my daughter needed wasn’t easy with a newborn as well, and I found myself having nightly anxiety as soon as it was bed time. I was always worried about the both of them needing me at the same time, and not being able to deal with it (literally physically not being able to do 2 things at once, but also not being able to emotionally deal with it). They were the hardest times of my life (sometimes still are). My son is 8 months old now and my husband and I genuinely look forward to 7pm every night when we can put the kids to bed, lol! I still deal with anxiety over the fact that I am raising 2 tiny humans, and that is the hardest part. I had no idea I would feel this way, and it caught me off guard. I had no idea I would be this anxious and worried and stressed with literally zero time to even shower, while simultaneously loving them so much I could burst. It’s insane. Thank you for writing this! I am new to having two under two, an 18 month old and a 2 week old! The baby sleeps a ton and my toddler is a whole new kid with sleep regression and suddenly can’t leave my side. He’s been a challenge more than having two being one. It’s nice to see a heads up on what may come in upcoming months. Some days feel so easy I feel spoiled. I know as the baby is more awake the challenges will keep coming at me. Thank you for so much honesty! Oh my goodness I totally relate on so many levels! My daughter just turned 2 last weekend, and my son will be 2 months next week! Glad to know that I’m not the only one going through the same situations! Although my daughter is also still teething, and we are about to move across country to back to California after only being gone for 6 months (#militarylife)! Pretty crazy over here but I wouldn’t have it any other way! Have you read the Wonder Weeks and/or do you have the app? It’s pretty helpful. You can prepare yourself before a regression or a leap comes and goes. I think you mentioned that it didn’t line up with Molly, but maybe it will with Riley. I feel like the infant stage is the hardest stage and I cannot imagine having an infant and a little toddler. Eek! You’re doing such a great job and your babies are so adorable! It’s not really sleep training, but such a gentle approach on setting up your little ones for good sleep habits. Just wanted to share some helpful info! I’m hoping for more sleep in your future! It gets better! My youngest is 10 months old now and my oldest starts preschool next week. I’m secretly looking forward to a couple mornings a week with only 1 kid to do the errands with! But I honestly think after month 4 was when it got better for me! Hugs! I have girls. Ages 8, 6, 5, 4, and 1. And yes all girls. We have been lucky as they all have been good sleepers and nap takers. 4 out 5 were preemie and in the NICU. So for them I had to wait tell the doctor gave us the ok. And then they sleep through the night. Putting my girls on a schedule and keeping with it was a big deal for us. We never did cosleeping. But they did sleep in a bassinet for the first couple of months. For naps and bed time. We always put them in there beds when they were really tired but no asleep yet. The first couple times it can be a little hard cause they may or may not cry. Now that they are bigger now, I keep them very busy during the day. And we play a lot. So come bed time and nap time they are ready for sleep. We also played soft music or nature sounds. Although I don’t have any children right now I am an aunt to my 2.5 yr old niece. She is about to welcome a baby brother in a few months and is a bit of a spicy nugget. I try to be as helpful as I can as an auntie, always offering my services. Do you have any advice on where I could be most helpful when baby #2 comes? Offering to spend some time with your niece would help out immensely. When my second was born I felt so guilty because I was always so busy with the new baby. We breastfed and that can be very time consuming in the first few weeks/months. Having someone around to take my older child to the park, or just to come over and play with them was a huge help. I felt like my older child was a bit neglected in those early days. My husband and i just had our 4th on July 5th and our oldest turned 6 the end of June. The other two are 4 1/2 and 2 1/2. While this has been the hardest adjustment in some ways, in others it has been easy. Its unbelievable how helpful they can be at ages 6 and 4. I rely on them a lot. I think I’m still in that newborn fog and just want sleep like you. I keep reminding myself to give grace where needed and try enjoy things the best i can. It goes so fast. It is so nice you keep it real on your blog. I love that about you. Keep on being the best mom you can be for Molly and Riley and letting everything else take its proper place. Having two is the hardest thing I have ever experienced in my life! And mine are 7 and 2.5. The sleep issues, mobility, and constant climbing have been the hardest part. And feeling like it is a 24 hr job with no sick or personal days where I am always on call! It is need after need after need. I daydream about spending a day on the couch or reading a book from start to finish. But my boys are so cute and lovable! My boys are 22 months apart and my 2nd screamed for 6 months with colic. We were not fortunate enough to hire a nanny so we did at all on our own . It does get easier and one morning you will wake up at 7 am and they will both still be asleep . It will happen . I am probably one of the older moms on here . My oldest just started his senior year of high school yesterday and I would give anything to go back to those sleep deprived days when all they wanted to do was snuggle. Keep your chin up on those tough days and try to sneak in even 10 minutes of alone time . You can do it !! Hang in there Mama!! My kids are extactly 1 month older than your 2. I’ve learned that the comparison game is so silly! Each kid is totally different and your experience with the first is so different than the 2nd (personality, sleep, needs, everything!). I’ve found life changed remarkably after my youngest turned 4 months – all around got easier. Starting good sleep habits now will serve you well, especially as Riley gets more and more alert (which is the biggest culprit in the 4 mo sleep regression). Otherwise, I describe this period as running a marathon every day in the middle of a tornado. LOL. All you can do is your best!!! Oh yes mama of a soon to be 4 year old and an 18th month old. It’s hard work, but it is true that things get easier when all the baby stuff is out of the way. Now I struggle with stuff like “please don’t jump off the couch” or “please don’t sit on your brother lol “. Hoping things turn around and if not go back to weee sleep they saved my sanity!! Good luck from Montreal, Canada! Thanks for you insight with two under 2 Ali! You’re doing a great job, I can tell. Your kiddos are so precious. 🙂 Come April I will have a newborn and a 17 month old. Definitely feeling a little nervous! it sounds like everything you are going through with 2 is for all moms of 2, not just 2 under 2! i followed a babywise schedule of eat wake sleep w my 1st and she has always been the best sleeper. i think you will find the benefits with starting it earlier w Riley too! so fortunate you have a nanny too! wow! Thanks for your post Ali! I’ll be a mother of 2 under two in 5 days and I’m definitely nervous! It was great to read about your experience in a realistic point of view! Thanks for all your tips and stories! Hang in there! My little girl is 8 weeks today! This post came at just the right time… thank you! She sleeps great at night, but will not let me put her down during the day, and some days (like today), she has yet to nap AT ALL. I’m losing my marbles. I’m so nervous about going back to my job working from home in 2 weeks. Any advice on how to work and make this work with her? Helllllllllp. This sounds so similar to my experience with my kids. They’re 20 months apart, with my oldest being just a week apart from Molly (I think). Baby girl is now 5 1/2 months and it seems like the two of them kept tagging off who would be more challenging from one week to the next. I would say, though, that our baby seemed to really chill out at about 4 months…and she’s been our only sense of calmness since then as the two-year-old grows more and more challenging. Two is hard, and the “all mommy, all the time” thing has amped up majorly…so much so that he’ll flat-out turn his dad away at times (and it kind of hurts my husband’s feelings, to be honest!). I know these challenging phases will pass…but man, it’s hard sometimes! So much harder than I expected. Hang in there & know you’re far from alone! I had twins when my son turned 2! OMG I’m still not sure how I got through it! Haha Great husband and support from family! We sent my son to full time daycare for the first few months.. at the time I cried and felt so guilty but then I realized it was best for everyone!! Hang in there life gets easier haha and/or harder I’m not sure?! But once everyone started sleeping through the night I felt like I could handle the day! I have been using a sound machine for my son since he was born and it is heaven. He is two now and has been sleeping through the night since around 11 months old. It is a blessing. White noise is the sound we use. 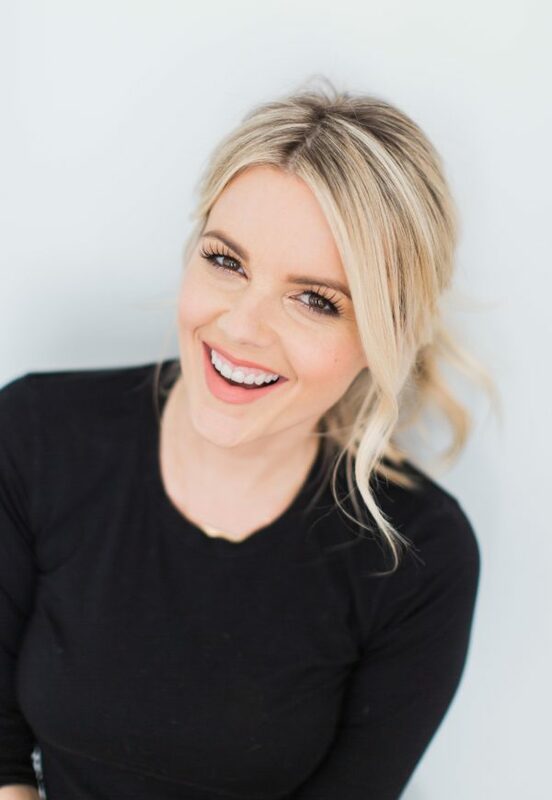 I’m sure you don’t have much time to read these days, but I loved Jennifer Fulwiler’s book, “One Beautiful Dream.” She is hilarious and talks about balancing being a mom of multiple kids and also keeping up with the things that make us, us. I loved the book so much I read it in less than 36 hours even with a 1.5 year old boy at home! I feel like I could have written this! I have a 4 month old and a 2 year old. It has been such an adjustment and only lately have I gotten into a better groove and feel more comfortable leaving the house with both of them. Luckily my 4mo has started sleeping 5+ hour stretches at night but she won’t go down until 10 or so, so it makes for a looong day (toddler wakes up around 6:30-7). I wish I had better advice but I’m still navigating it myself. You’re definitely not alone and I do hope it gets a little easier and you get more sleep! I love following you, especially because I had my two kids almost at the exact same times as you! My daughter is a week older than Molly, and my son is one month old. I have a similar experience in that the first 3 weeks seemed like a breeze, and I find it getting harder and harder now that we’re in the second month!! Balancing two young kiddos is no joke! I have been in tears a few times this week! But we can do this!!! The hard parts are so temporary! Good to read this as i can relate!! I have an almost 11 month old & a 2 week old, so 2 under 1!! Amazing how easy going from 0 to 1 vs. 1 to 2 was now looking back. Hang in there!! We’ll get thru it (lack of sleep and all)! Thanks for being so honest and real!!! This is perfect timing as we are expecting our second and our first will be 20 months when the next one arrives. I’m excited but incredibly terrified!!! Our first was a great sleeper but still those first 2 months were really tough. I do NOT do well with no sleep! So I’m really scared to go through that again and have a toddler. I’ll defintey be looking to your blog for advice. It is also helpful to know someone else is or has struggled with the same thing so you don’t feel crazy! I have a daughter and son – 12.5 months apart, they are now 1.5 and 2.5 years old. I have found it refreshing to read your posts and see your honesty about the struggles – because they are real! It’s the hardest job (I never understood this statement until having my own). I have many days where I say to myself, “this is no fun” – two needy, crying toddlers is no joke. But, what I can say, is that I am starting to notice some change in my 2.5 year old. She is now able to do a few things on her own and I’m slowly getting to the point where I can verbally reason with her. My sister has two kids ages 7 & 10, and after recently babysitting them I was stunned at how much easier kids that age are. So, as most people say, it does get better. Until then, I try not to wish away any of this time, as we will no doubt look back on it and wish they were little again. Thanks for keeping it real – we all need to be there for each other! I love reading your blog!! It’s so real and honest about the difficulties and joys of motherhood. I have two as well. A girl also born in July 2016 and a boy born in March 2018. It is so difficult at times but so wonderful! None of my friends have babies yet so I love reading your blog and being able to relate to other moms who are going thru the same stuff!! Thanks for being so honest! Highly recommend “The Baby Sleep Science Guide” book. It’s all about developing good habits and avoiding the 4 month sleep regression. It’s written in a very informative, but not judgey tone. I read a ton for my first daughter (didn’t sleep through the night until 8 months after miserable cry it out sessions). Thanks to the wonderful PhD and MA’s advice, we never had my 2nd cry it out and she was sleeping through the night so early, it was too unimportant to remember how old 😂. Going back to work with two kids is no joke, especially with pumping. I relate to your blog so much! My kids are 6, 5, 3, and 1. The phase you are in right now is SO physically demanding and draining; you WILL hit your stride and find your normal. Sleep will make SUCH a difference (as you know). Plus breastfeeding is so draining those first few months. I’m glad you hired a nanny! Does Mollie get out of bed right away when she wakes up? I keep a stack of books in my kids’ beds and they can’t get out of their room til 7 (except for potty of course :)). I know they make clocks for really little ones that turn green when it’s time to get up. Maybe mollie would respond to that and you could set it for 6 (and as she gets used to it, back to 6:15…) and maybe that would give you at least til 6? I hope sleep is in your near future! Your kiddos are beautiful; you’re doing a great job ! My oldest two are 16 mo apart in age. Keeping to a schedule saved my sanity and i personally think kids do well with knowing what to expect. I worked hard to get them on the same afternoon nap schedule and used that time to regroup. I allowed one chore but the rest of the time was that recharge. My husband was in the military at the time and deployed from the time our youngest was 5 mo-14mo so i was mom AND dad and needed that time. That would be my biggest advice, have them nap in the afternoon at the same time. I was pretty strict about bedtime too and they were great sleepers. (Goes back to that schedule/routine) I typically did cleaning etc once they were in bed (7:30-7:00). I also put them in Mothers Day Out 1x a week so i could grocery shop without kids. I made any appt i needed (hair/dental etc) during that time. It really does get easier but it constantly changes-just when you feel like you have a hold of something, something changes and you’re having to adapt. I love hearing someone is going through the same thing! I have a three week old and a 2 year old at home. Our oldest has been so clingy to me lately… and kinda rude to dad! “Mommy do it.” For everything. I feel bad for my husband and he knows it’s a stage but it breaks my heart when she is mean to him. This has been our hardest transition so far. Like you said a new baby is pretty easy- when in that infant stage still! We’ve been so lucky to have a lot of family in town to give our oldest one on one time in the morning before nap time- truly a life saver!! I’m already So nervous for when I have to go back to work after 12 wks. Motherhood is hard- we got this!!! I loved reading this. I have a 2 year old and a 2 month old. The first 6 weeks were by far the hardest thing I have ever done. My toddler has adjusted very well (thanks to the iPad to keep her occupied 😬) but my newborn was extremely fussy and the witching hour may be the death of me. I also have a 17 year old son and it goes by so fast that soon these hard days will be a blur of the past . I can’t wait for the day when I can leave my house with no anxiety of is my newborn going to scream or is my toddler going to throw a fit?! So similar to my last two months. I’m in the thick of it too! 8 week old son and 2.5 year old daughter. Potty training has been a nightmare since she was basically going on the potty before the big change, then regressed when the in laws visited/ baby boy arrived. My son is sleeping through the night so I’m hoping that continues. I still get up once since I’m breastfeeding too and ‘my girls’ my break off if it don’t! Hang in there! I have a 3 year old and a 2 year old. They are 13.5 months apart. So my daughter had only really just turned 1 when my son was born. It’s tough at the beginning, I think my daughter was almost too young to be super jealous, but she still had her moments. I found bedtime hard, my husband travels and both families are in the uk. Bedtimes always seemed a little manic. But hang in there. Because it does get better and they will become best friends! They play all the time and have such a great bond. My son also potty trained himself at 2 as he wanted to be like his sister. So no more diapers for the win!! I am a nanny (have been for nearly 4 years), the easiest thing to do for your nanny and Molly is to lock the door and pretend like you arent there, or take Riley for a walk/leave the house. Go somewhere where Molly can not see you/hear you. This may be hard for her at first but this pushes her to trust your nanny and helps her understand “mommy is working.” This will also help your nanny bond with Molly and be able to settle her down and instill trust that mommy will be back soon! So I think now that the Nanny has been coming for a bit Molly realizes she’s will have to leave you and spend time with the nanny. That could be the reason for the clingy-ness! It will all smooth out! You are doing an awesome job! Hi Ali! I LOVED this post! It helps so much to be able to relate to other mommas so we don’t feel alone! My daughter Everly was born on the same day as Riley. 🙂 I loved following your entire pregnancy journey since I was right there in the same timing! I’m on month 5 of the ‘two kids club’ right now – I’ve enjoyed reading about your experience! One of my favorite things now, a few months in, is getting to see my youngest develop her own little personality and fall in love with her big sister! Her smile when we pick up the oldest from school is the highlight of my day. Who knew watching them love each other would make me love them even more? I love this post and this blog! You have helped me navigate two under two with your honesty and realness. It is so rewarding, but it is so hard. I always say that I need to be an octopus to have enough arms to care for both kids. I never feel like I am giving enough to either one of them. I think that’s just the reality of having two little ones who need you 100% of the time. I have to remind myself that it will change and it will get easier. They will not always need you to change their diapers, get them a glass of milk, cut up their fruit, buckle them in their car seats, put them to sleep, get them back to sleep, etc. When you think about how much you have to physically do to keep them healthy and happy and to meet their basic needs, and how much autonomy they will gain in the next few years, it really puts things into perspective. This is just a brief season of being extra-needed, and it’s fleeting, beautiful, and so challenging. Keep it up, mama, you are doing so great! This chapter will close before we know it. Hugs and solidarity. Sooo good! I so appreciate the real transparency. We have a 2 month old and a 22 month old- so we GET IT! It is a wild ride, but man it is such a blessing. I have learned that it is so helpful to let go of expectations I may have for how our day “should” look. It’s a TAD easier to endure the hard days knowing already with our first babes how fast it really goes. Things will be hard tomorrow and the next day, but we get better at them! Things that were hard yesterday won’t be as hard the next day or next week. You got it mama! It seriously feels like this could have been me writing this. The first month sleep haze trickery, the absolute necessity for the carrier in month two, the super needy toddler in month three. My daughter is 19 months and my son is 8 weeks – just hearing that you are getting through this and coming out on the other end with some sort of wisdom and sanity is so encouraging. 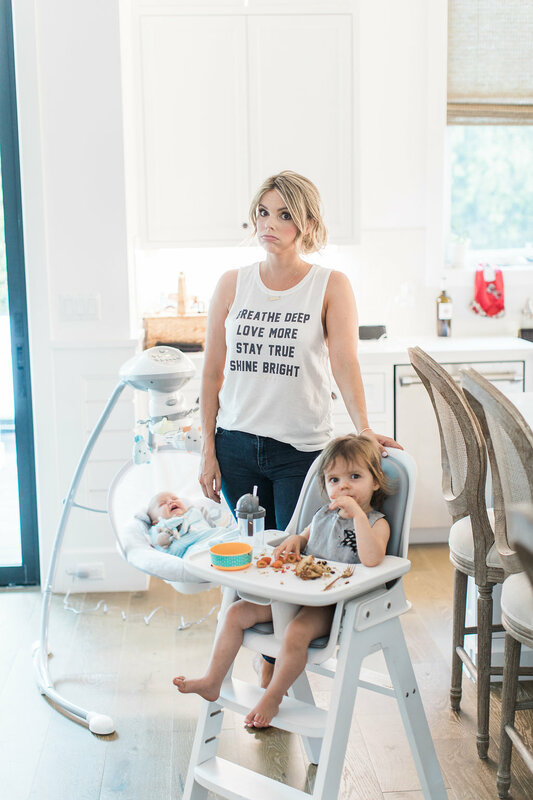 The fact that you’re willing to admit how incredibly hard this whole mom thing is – especially with two under two – makes me feel so much better!! You are a wonderful mom and I’m thankful for your story! Being a mom to two is just a whole another level! Not only do you have your hands full but you will literally very rarely have time for yourself so if you’re super selfish don’t have kids or don’t have a second one lol! Sorry but not sorry because it’s the truth unless your oldest is totally independent. Whoever said having a kid back to back was a good idea was an idiot. Both my girls are 2.5 years apart but good god my hands are more then just full because I’ve always been that Super Mama who thought I could do it all but after having a second child I realized it’s just impossible. The best thing you did Ali was get help, that’s the best advice I would give anyone with more then 1 kid…get help, ask for help, pay for help for your own sanity. I look back at my mom and all these other mothers who had multiple children & am just shocked they survived lol, I feel so weak compared to them because I’m such a whiner lol! I love and would do anything for my kids & am so thankful I have two kids but good god there are days where I literally don’t have time to shower, eat, watch my shows or he’ll even finish a cup of coffee. It’s all the little things you wish you had more time for lol! It is what it is. Love reading your posts Ali! Have you tried using the Ollie swaddle, I know some babies like there hands free but this swaddle was a game changer for me. ( I have 5 boys) my last two were twins ( about to turn 1 this month) so I needed all the help I could get! Nightly routines are good and I would do tummy time, then diaper change, swaddle, then nurse, then bed- this helped a lot because tummy time worn them out so they would sleep longer! Your doing great and and every child is different so just find what works for you! I remember bringing my son (who is now 18 months) Home and my daughter (was then 19 months, now 3) had quite some jealousy the first few weeks. My son was a big eater and I remember he was about 2 weeks when I thought to myself “I can do this! I’m going to cook dinner by myself!” Of course halfway through my baby needed to eat and I completely forgot about the dinner. The chicken and rice were completely charcoal when I remembered. My hubby got home and I told him it was frozen pizza again! Seriously though it’s such an adjustment and just when you think you got it down, the 4 month sleep regression or something hits! That ruined us for my son from about 4 months-almost a year! I know some kids don’t have it that bad but we were not lucky. Hopefully things ease up for you!! My daughter did great after the first month or two as well, and I’m glad they’re so close in age because now it’s like she doesn’t remember any different! Also my son is the best sleeper in the world now, so thankful to be at this point haha! Good luck to you guys!! I’m a Mom of twin daughters who are now nine months old. I selfishly enjoy when Mom’s of one add their second and finally understand my pain 😉 sounds like you’re doing a great job and it will get easier! My son is two days younger than Riley so I love hearing about what you’re going through with him. He has also been up the past 4 nights every 2/3 hours been crankier than usual and isn’t nursing so great. Turns out it’s a wonder week and we just have to ride it through. He finally slept 4 hours last night right when I was going to lose my mind so here’s hoping things get better for both of us! I only have one child but this past week has made me consider getting at least some part time nanny help especially because my husband works long hours. I don’t know how you managed by yourself even with just Molly. Anyways please keep sharing, love that I can relate to someone in the perfect insta world that can sometimes be so fake. Thanks for keeping it real! Hi Ali. My oldest just turned 2 last week and I have a 4 week old so I’m following all of your updates to prepare myself 😊 I think I remember reading in an earlier post that you had gotten some sleep assistance to help with Molly. I wonder if they said waking up at 5:30-/6a is normal for her age. Because my 2 year old typically goes to bed 7:30/8p (doesn’t always fall asleep right away) and doesn’t wake up until 7a or later typically and she still take a 2-3 hour afternoon nap. I know all kids are different but I wonder if there’s a way to get Molly to sleep later for your sake because I know how much we could use more sleep. Especially with night nursing. Hi Ali, I love reading you blog. My daughter is 5 weeks now (first child) and I’m always looking out for good and tricks! You mentioned that your going to start putting your little guy on a schedule soon, that’s my plan for Lucy as well so I really hope you write about it and how it’s going! More specifically sleep tips! Since you’ve experienced a difficult sleeper what will you try or do differently this go around? Also my little girl won’t sleep anywhere but in my arms or right up next to me in bed. For now she’s so young so it’s ok but I’m super worried she will struggle later settling in her own crib. Anyway looking forward to following your journey! I love the realness of this post! Entering month three soon with my first, can’t imagine having two yet, tending to my little dog is hard enough. Keep up the good work mama and thanks for the inspiration! Hi Ali! I have two boys. Chase turned two at the end of July and Maddox turned four months at the end of July. I feel your pain girl! Month five has been a little better. Last night, I got five consecutive hours of sleep for the first time in about eight months. Some days I feel so exhausted and defeated and others I feel like a rock star! My two year old is getting his tonsils and adenoids out in October due to sleep apnea. I am dreading this for so many reasons, one of which is how hard it’s going to be in the weeks after. When I’m having a hard day, I tell myself the truth: No one, NO ONE, could do this better than me. I am their mama. Daddy, grandma, Nanny…they’re all wonderful but no one does it better than mom. Hang in there girl. You’re right about taking it one day (sometimes one hour) at a time. We got this! First of all I love your blog and you were one of my favourite bachelorettes. Second, those two munchkins of yours are absolutely beautiful. I have 17 month old boy/girl twins, and let me tell you those first few months were HARD. They spent a month in NICU(preemies) and had to be fed So often to gain weight regardless if both were sleeping. I remember setting my alarm so I didn’t sleep through a feed and would forget who I just fed. Thank god they aren’t identical haha. Only one would breastfeed so I made the decision to exclusively pump and bottle. Which made things a little easier. But time consuming. My husband would walk In at the end of day and I would be covered in puke, not knowing when I showered or ate last haha. I would tell people to bring meals when they came to visit. We call those days the “dark days” haha. Pale skin, unbathed, always hungry mom I was haha. Survival mode those first three months. BUT, schedule and routine was key. I ended up splitting them apart until they slept through the night and then put back in same room. Napping at same time made it easier to make plans and for quiet time. Now they play together non stop and that twin bond is serious stuff. One cries and the other comes over with their favourite bunny and rubs the other head and Those hard days feel like so long ago. We waited 3 years for these lil miracles with some losses in that time and I could seriously cry when sweet moments like that happen. Thank you for your honesty regarding motherhood and postpartum struggles. One of the many reasons so many of your followers love you. We live on the Eat, Wake, Sleep schedule! It has worked with both kids, along with a consistent bedtime routine! Our little girl is older & has gotten more loving each day with her baby brother. Amen Ali! I have a 2 year old and an 8 week old. It’s so challenging and I question daily if I’m doing a good job. Reading your blogs makes me feel better at least knowing I’m not alone in this journey. So thankful to have these amazing kids but damn it’s hard!!! Ali, you are doing so amazing and putting so much effort into your kids and your job, you are quite inspiring! I’m in the same boat, almost…I have a baby boy due any day an an 18 month old girl! I’ve throughly enjoyed reading all of your experiences and stories on everything. I’ve seen many times you have some kind of pack and play or play yard that Molly would be inside in the kitchen if you were trying to get work done…it looked tall enough that she couldn’t get out. Could you please tell me what that is!!!?? I need that badly. Wishing you all the best and cheers to you! a lot of comments about the title. Molly herself titles her video as “blind girl. yes, i am fully aware that molly is more than just “a blind girl or “my blind friend. molly is my friend, who i talk to and see very often, off camera, and care about very much. however, the point of this video isnt my friend style swapping me. it”s showcasing how someone who is blind is able to do something in such an incredible way regardless of disability. the majority of the people on the planet dont know “molly burke is a blind person, and titles are meant to appeal to a wide audience (which is why molly herself titles her videos “blind girl). molly is my friend. if she was hurt or offended by the title, the title would not be there. I cannot tell you how much I look forward to reading your blog! I recently went back to work leaving my 6 year old boy , 4 year old girl and 6 month old girl at home with my new nanny as well. On most days I’ve had a minimum of 4 hours of sleep….not consecutive! My baby girl was a sleeping goddess until she hit 4 months! Now she’s up every 3 hours to nurse. Once I get her back down, my 4 year old is up most nights wanting to cuddle with me at 2am! She is going through the “needing mommy 24/7” ever since we welcomed Bella 6 months ago. So I can relate! Any continued advice there would be awesome! Just know you are an inspiration and I love how real you are! When I saw you a few weeks back on tv openly talking about your post baby body I wanted to cry. I related to every thing you said and felt. In addition to be exhausted each day I’m feeling so horrible about my body. I love to work out but just can’t find that time for myself these days. So every morning, while I’m getting dressed I feel horrible about myself and body. While I was on maternity I worked out for a month but found my milk supply dropped with all the sweating, so I stopped because I was too stressed about not having enough milk. One last thing! I’m obsessed with your bar stools, but I have messy kids. Will the fabric clean easy on the cushions?? Wish we can share stories over wine!! On that note. What’s your fav wine these days?! Have you looked into the gro clock? It has saved us! I have two boys 24 months apart. My youngest is 3 months old and his brother was waking up at 5:15 and I could not handle it with a newborn! The gro clock took a couple weeks to work but I’m happy to report my son now sleeps till 7am everyday!! Sometimes he’d wake at 6:30 (which is still good compared to 5:15) and I’d go into his room and say oh your clock isn’t yellow yet go back to sleep and he’d go back down!! He gets so excited when he sleeps to “yellow” and shows his new brother how he slept till yellow. I’m trying to decide if sleep training is worth it. Would you say that sleep training was beneficial to Molly even though she’s an early waker? I know sleep trainers frown upon getting your baby out of bed before 630-7am. I’m just asking because I would like to know if you think it’s still worth spending money on? You nailed it on the head, this is exactly how I’ve been feeling with having to leave my 5 week old next week! I have to say, you’ve been so amazing to follow and helped me not to feel alone in my first time mommas moments so thank you for your transparency in this time. And… he loves the Philips Avent bottles. Which selfishly makes me so sad he doesn’t always need mommas but it’s nice to know he will be well feed when I am at work. Good luck tomorrow, you so have this! Oh, I love this! My little guy will turn 3 months this week and my oldest turns 4 in a month. So I don’t have two under two which sounds very difficult but it’s still tough. A lot of sibling love but also jealousy. Mine is still waking every 3 or so hours. His longest stretch is 5 hours (one time). Mostly it’s 3 1/2 consistently for the “long stretch”. And only cat naps during the day. The hardest part is not being able to nap during the day for sure. My older son was still taking a long afternoon nap probably for the first month but we cut it out because it was effecting his bedtime. Dang it! I can’t wait till the sleeping through the night stage. Which wasn’t until 9 months with my first either! But I’ve already got a baby who puts himself to sleep 90% of the time! So yay! This is exactly what I needed ! My daughter is 2 and a half and our son Just turned a month and a half. The first few weeks were rough between the combination of jealousy and neediness from my daughter plus our little man was born at 5 pounds so he was playing major catch up and waking to eat every 2-3 hours! It is nice to see that I’m not alone in this! I was actually looking for your post on Molly when you sleep trained her – is it possible to send me the direct link? Thank you for sharing your experiences and hopefully we get some sleep soon!